When I was a teenager, the first kid I ever babysat was a three-year-old boy with a predilection for stripping his clothes off at a moment's notice and a passion for 'dip.' Only to him, any food that was liquid was dip. Syrup, salsa, ketchup, soup, honey, yoghurt and even some solids like cereal all qualified as dip, and his parents used this fascination to get him to eat anything he didn't otherwise want to eat. (Refuse to eat broccoli? Here's some cheese 'dip' for it and now Ben is loving it!). I adored that kid and recently realised he's now old enough to be out of college, so clearly I am an old lady. In the spirit of that adorable kid, I present to you two pleasingly retro but still tasty dips: one savoury, perfect for spreading on crackers, toast points or veggies, and one sweet, great for dipping berries or other summer fruits. Also the sweet one is literally the only sweet dip I think I've ever tasted in my life, so chances are you've had it before, at least if you grew up in the US in the 1990s. I had to go to four different grocery stores to find water chestnuts, but I persevered because they seemed like an integral part of a recipe I otherwise had my suspicions about, and I'm glad I powered through, because the water chestnuts provided a much-needed crunch to contrast the creamy smoothness of the dip. I made these both for the same party recently, and the veggie dip was the biggest hit by far. The bread bowl was also a good decision- everyone at the party loved it, and by the end of the night the entire bread bowl and its contents was gone. 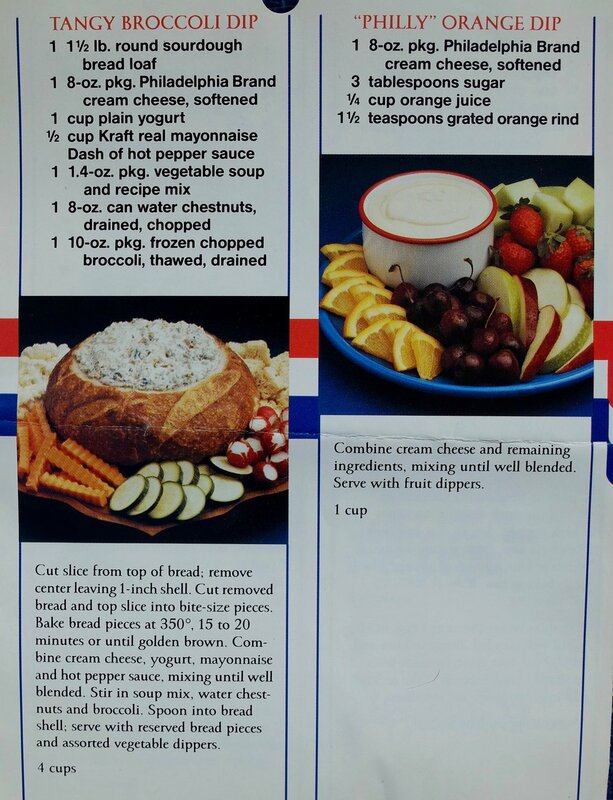 And honestly, a bread bowl might be the most retro food this side of curly parsley, but I challenge you to find a serving vessel that easy that doubles as a snack in itself. The fruit dip, while tasty, was definitely the bigger letdown- I guess maybe as a grownup you just realise that fruit is sweet enough on its own and doesn't really need to be dressed up. It was still lovely, but I'd probably bypass it next time (unless I was working with off-season fruit that needed the extra bit of sweetness). Also, probably this is down to the weather, but when I mixed the ingredients as listed in the recipe, the dip was far too thick, so I added some additional orange juice, and by the time I served it, it was too runny to dip, leading to a last minute trip back out for more cream cheese to thicken it back up. 4 spoons out of five. Although if you were asking our party guests, I think they'd give it 5 spoons. 3 spoons out five. It was tasty, but given the issues listed above and the fact that I just feel like fruit doesn't need additional sweetness makes me think this dip was just unnecessary. Cut slice from top of bread loaf, then scoop out bread from inside, leaving a crust at least 1-inch thick. Cut bread removed from inside into slices or cubes and toast at 175C/350F until golden. 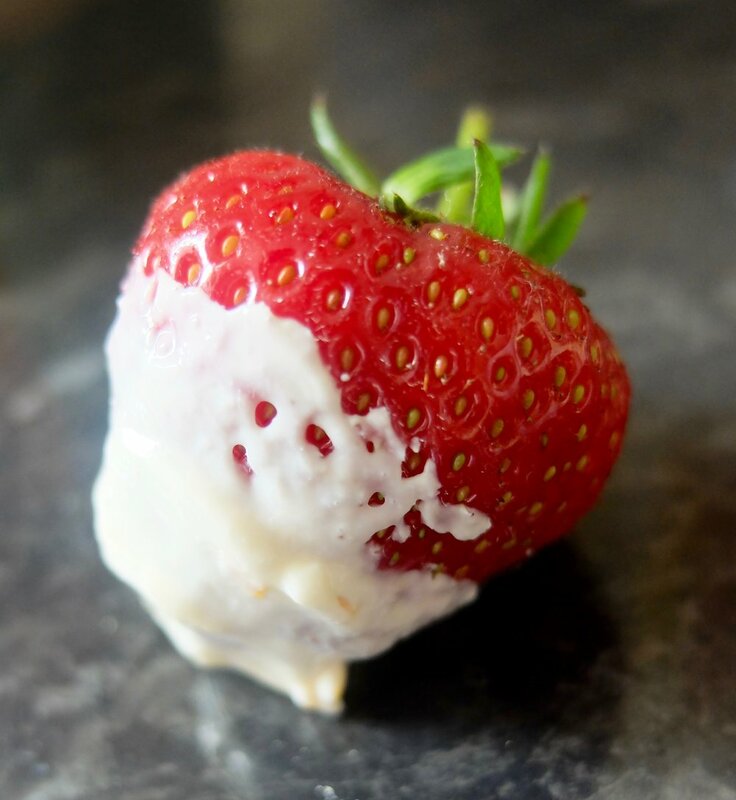 Combine cream cheese, yoghurt, mayonnaise and Tabasco, mixing until well-blended. Stir in soup mix or spices, water chestnuts and broccoli. Spoon into bread shell and serve with reserved bread pieces or crackers, and fresh veggies. Stir cream cheese, sugar, orange juice and zest together until well-blended. Chill at least one hour before serving with fresh fruit.